Information Technology University’s two-day Grand Robotics Challenge successfully came to an end on 28th August with a final match between the two bots that had cleared the semi-finals. The bot Bulldozer claimed victory by beating its counterpart in a thrilling match. Bulldozer’s creators; Saad Raza, Aazaz ul Haq, Taha Muneeb, Shahzil Hassan and Hamza Shafqat; were ecstatic at their achievement. 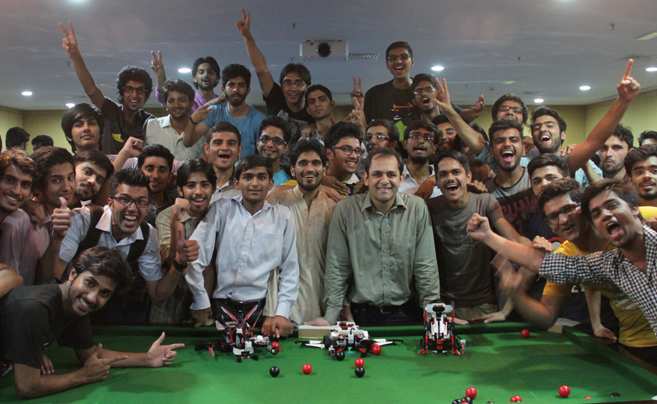 The Grand Robotics Challenge, which consisted of 28 robots built by teams of five students each, was the culmination of MATLAB, a unique course offered at ITU which teaches both advanced mathematical programming and robotics. Using the mathematical programming skills that had been taught to them during the first half of the course, students were required to creatively build robots using Lego Mindstorm Robots in the second half, and program them to perform certain functions. Mr. Abbas Akhtar, who taught the course, explained that the robots were not remote-controlled; he was extremely proud to relate that his students had successfully built ‘intelligent’ robots which had been programmed to conduct certain types of movements and respond to situations. The robotics challenge consisted of a football-like game in which robots were required to capture red-coloured balls and bring them to their side of the field. Using colour sensors and other such equipment, alongside smart coding, students were able to program their bots to play the game without any handling. The event was open to public and took place in a lively and interactive environment infused with a spirit of healthy competition. In keeping with ITU’s teaching philosophy which encourages interactive learning, this robotics challenge represented the final grading component of the course MATLAB. 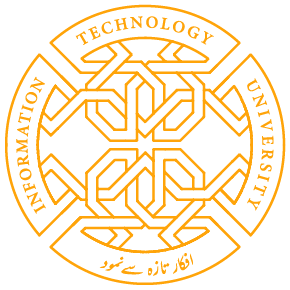 Students were graded by a panel of ITU faculty members and industry professionals who used a criterion which included robot-building skills, creativity and originality, robot aesthetics, team work and competition performance. Share the post "Robotics Challenge Ends with Victory for Bulldozer"